Now available from Professional Percussion Products! 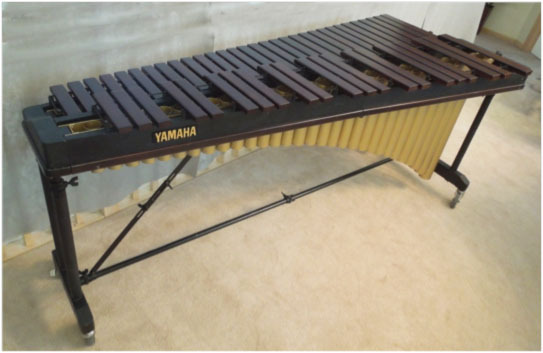 We are pleased to announce the immediate availability of a pre-owned Excellent- condition 4.3 octave Yamaha Professional Model Marimba with Rosewood Keyboard. This is an affordable way to own a ROSEWOOD Professional sounding instrument that is in perfect condition. This instrument is available for testing and evaluation to qualified buyers on a first-come-first -served appointment basis. This instrument's availability will not last long, as a quality condition 4.3 octave instrument does NOT become available on a regular basis. 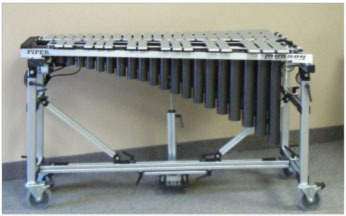 Professional Percussion Products proudly offers this full size professional instrument, fully height adjustable 34" to 40", three resonator height settings, 4" locking casters, simple-quick set-up and is easily transportable in compact vehicles as the frame-rails and resonators are hinged and fold in half-size. This instrument has been meticulously cared for with very little wear to the keyboard, frame or resonators. Full-size graduated keyboard 2 1/2" to 1 5/8th inch bar width. A-442 Keyboard is in perfect condition with no scratches, chips, cracks, dents or dead out-of-tune bars. Bar cord and springs are in the same condition, showing very little wear. No sag in the all-wood bar rails, no buzzes or rattles in keyboard or resonators. This generation of the Yamaha Professional Model featured one of the most sturdy well-designed portable frames with pneumatic height adjustment mechanisms the company has ever offered. Its ease-of-function, quiet operation and visual height-gauge allows for one-person absolute even height requirements at both ends of the instrument. This instrument is perfect for personal professional performance use, home teaching or practice studio, school concert auditorium or recording purposes. CONTACT Professional Percussion Products to discuss the instrument, answer your questions and to schedule an appointment to test-play and experience this wonderful instrument! 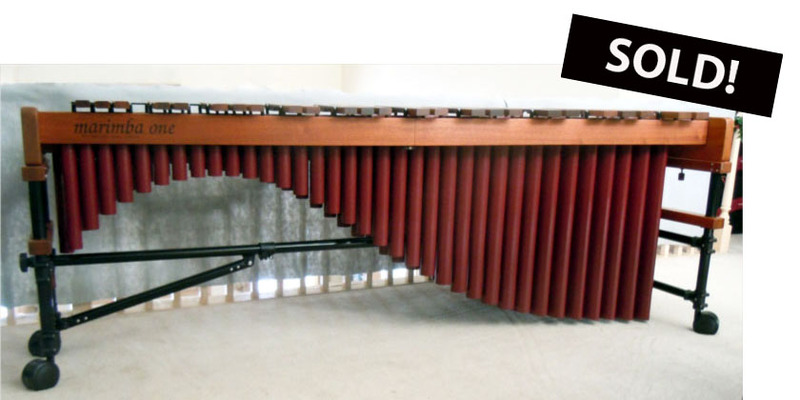 PRE-OWNED FIVE OCTAVE MARIMBA ONE, now available from Professional Percussion Products! We are pleased to announce the immediate availability of a pre-owned mint-condition five octave Marimba One instrument - WITH CASES! 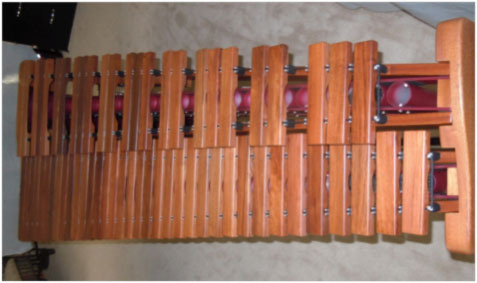 This an extremely rare opportunity of a lifetime to own a five octave MARIMBA ONE instrument, that is in perfect condition, complete with Marimba One cases. This instrument is available for testing and evaluation to qualified buyers on a first-come-first -served appointment basis. 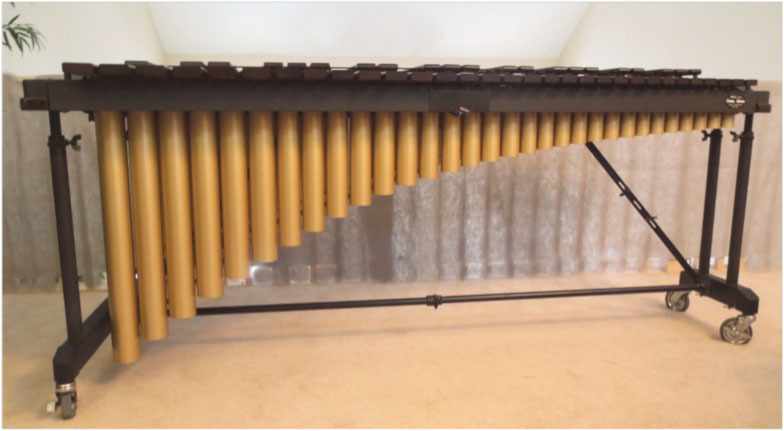 This instrument's availability will not last long, as a quality mint condition five octave Marimba One instrument does NOT become available on a frequent basis. 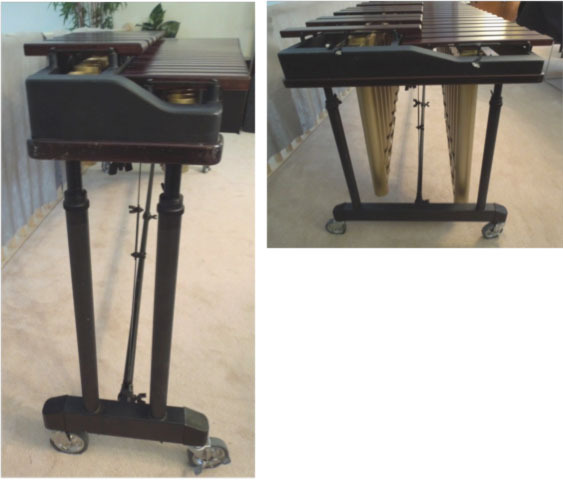 Professional Percussion Products originally sold this instrument to a percussion major in NE Ohio not long ago who has moved on to other professional performance opportunities not requiring a marimba. This is a fully height adjustable model with a fantastic Enhanced Keyboard quality that was factory "standard" on these instruments a few years back. All-wood frame rails and the stunning Maroon resonators would all be extra-charge options - if ordered new today. This instrument has been meticulously cared for with only one minor resonator scratch. Otherwise this instrument would pass as a brand new instrument in sound and appearance. 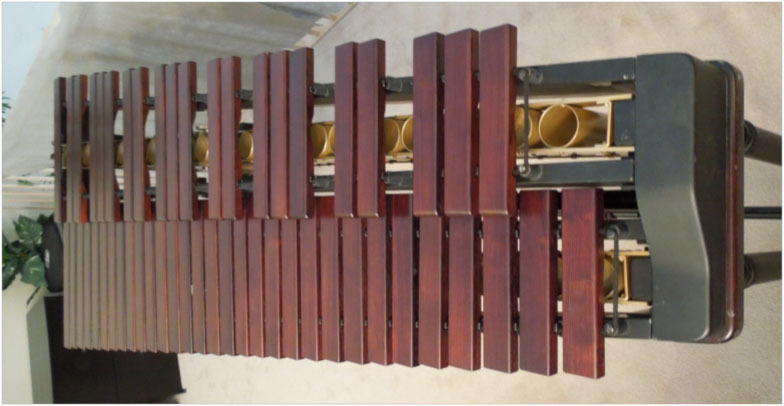 Accessories included provide for a full instrument length padded Marimba One drop-cover, factory Owners Manual, and resonator touch-up paint. Keyboard is in perfect condition with no scratches, chips, cracks, dents or dead out-of-tune bars. Bar cord and springs are in the same condition, showing very little wear. No sag in the all-wood bar rails, no buzzes or rattles in keyboard or resonators. 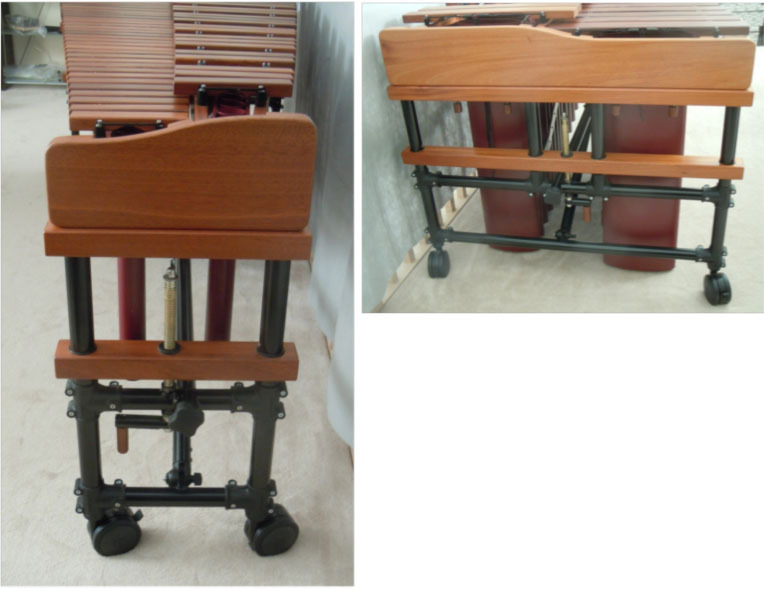 This generation of Marimba One featured one of the most sturdy well-designed frames and height adjustment mechanisms the company has ever offered. Its ease-of-function, quiet operation and visual height-gauge allows for absolute even height requirements at both ends of the instrument. 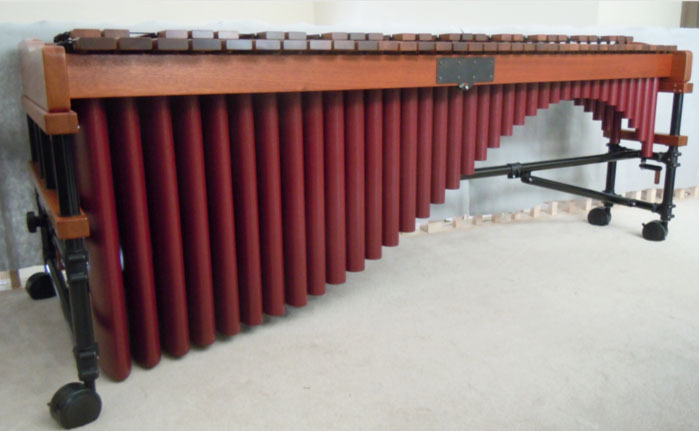 Anyone who has ever moved any five octave marimba of any brand, knows the physical challenges of carrying and moving these massive instruments - while not damaging any component of the instrument. 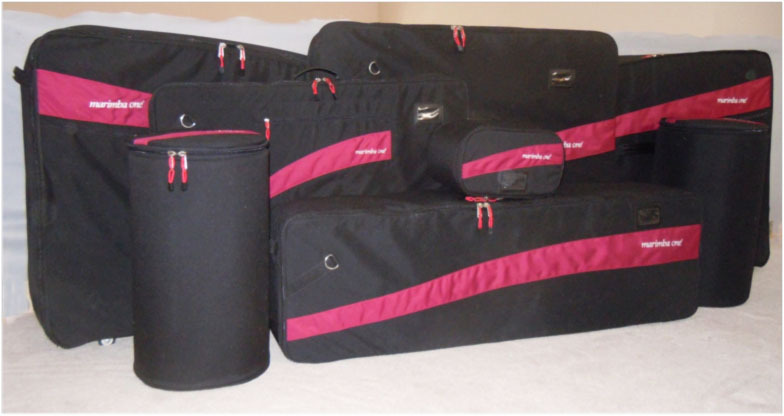 The Set of Eight Marimba One Padded Cases makes for easy transportation, instrument storage and includes all bar wraps, resonator protectors, and shoulder-straps. The three heaviest cases include the factory upgraded version with built-in casters on the two resonator cases and the single-case containing the four instrument keyboard rails and all metal frame cross-bar hardware tube-connections. CONTACT Professional Percussion Products to discuss the instrument, answer your questions and to schedule an appointment to test-play and experience this wonderful instrument. 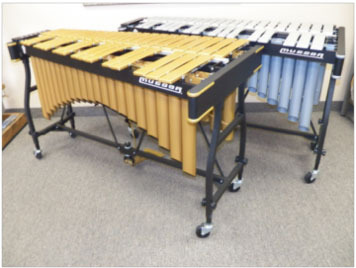 Professional Percussion Products has become the leading resource to professional players, teachers, schools and studios for having a variety of MUSSER VIBRAPHONES in-stock and ready for your test-playing experience in the by-appointment showroom. New instruments, demonstrators or used trade-ins - inventory is constantly changing as we ship instruments all over the world. 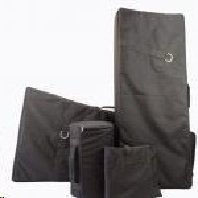 And, as a stocking Beiner Bags resource, we have padded custom made Vibraphone cases for all Musser instruments on hand, and can easily order case sets for all other brands of vibraphones. Whether you're looking for a Musser PRO VIBE in gold or silver finish, or the PIPER VIBE - we have immediate access to all models. Our knowledge of the product, care, transportation and set-up, helps every Vibe Gallery visitor make a knowledgeable decision in selecting the perfect instrument for your needs and investment. The orchestral percussion showroom-gallery has a complete display of the most popular Vibe Mallets from, Firth, Balter, Malletech, Musser Good Vibe, Innovation and Encore brands. $775.00 for complete set plus shipping. CONTACT Professional Percussion Products to reserve your instrument and to schedule your appointment to test-play this instrument. in our orchestral percussion showroom-gallery. 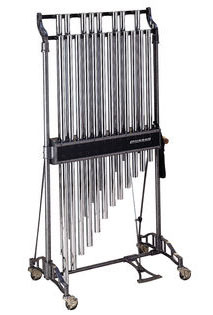 Professional Percussion Products has just received notice of another special set of Musser Symphonic Chimes that have become available at a one-time-only pricing. This professional top-of-the-line instrument has all the features and player requirements found on performance instruments in the finest concert halls. One and a half octaves of brilliant full-size chrome plated 1 1/2" diameter tubes, makes this a spectacular instrument for concert hall, conservatory, church or recording studio. This instrument provides optimum volume, projection and pitch clarity along with frame-stability and portability of the instrument. Includes Musser factory new instrument warrantee and standard rawhide mallet. to reserve this instrument, now available at special savings.